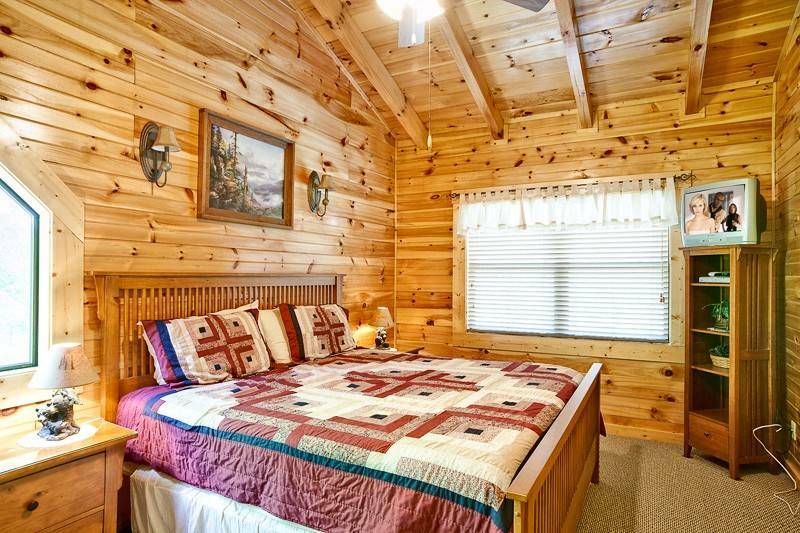 Sweet Dreams is a beautiful 2 bedroom and 2 bath log cabin. 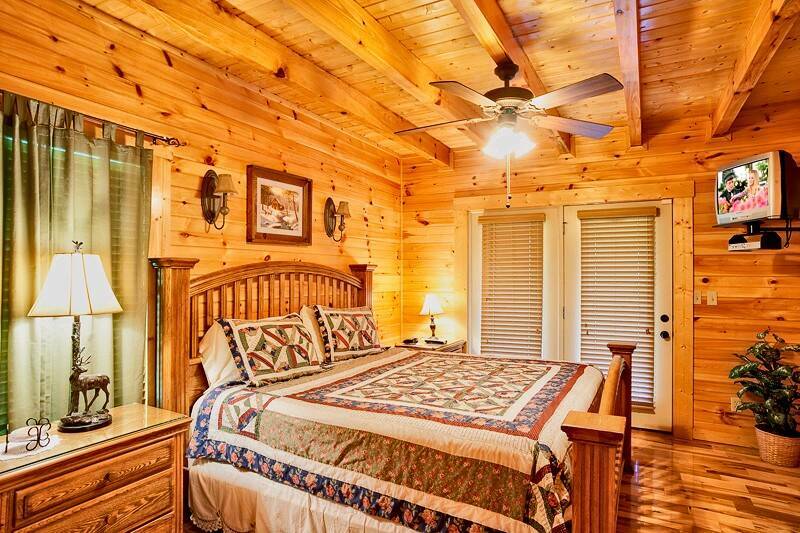 This wonderful cabin is located in the heart of the Great Smoky Mountains. 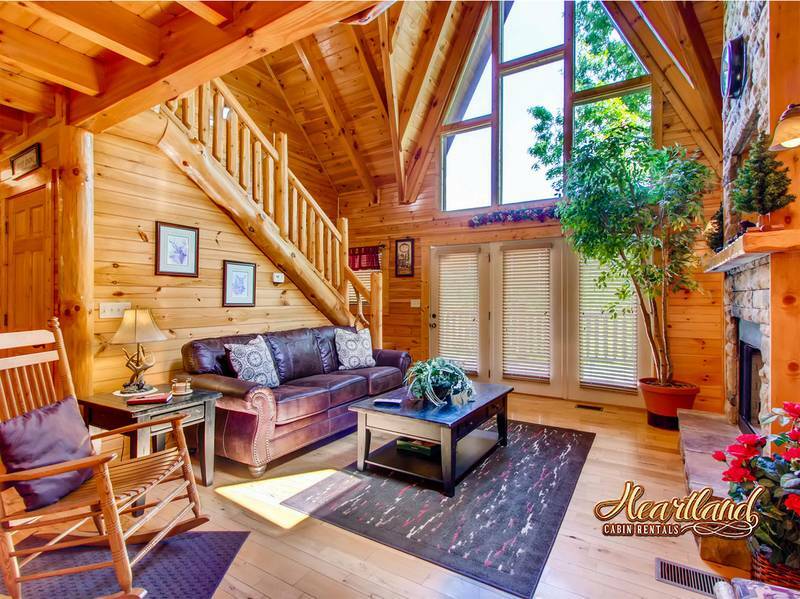 This log cabin features the best in amenities for your perfect family vacation, anniversary getaway or romantic honeymoon. 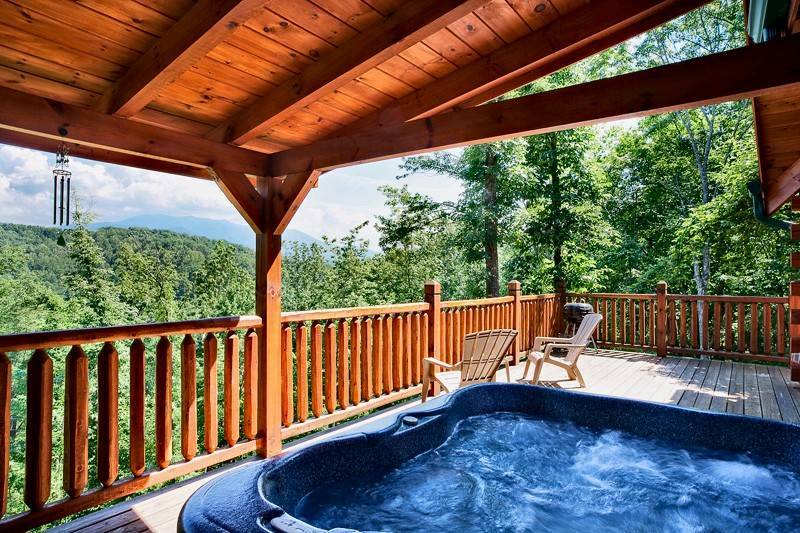 The outdoor hot tub looks out upon a private wooded area with a scenic mountain view. There are two king size beds, Jacuzzi and Pool Table within the cabin. The master bedroom has a jacuzzi and king bed with french doors that open up to the covered deck with hot tub and mountain view. The living room also has french doors that open to the cover deck with hot tub and mountain view. Imagine yourself on the deck enjoying a cup of coffee or having breakfast while enjoying mother nature. This cabin is decorated for Christmas! Really nice cabin. Renee in the check-in office did an exceptional job she was very knowledgeable very good at explaining the process. Did really well describing some of the local attractions and things-to-do. Didn't seemed rushed at all very nice person. Very nice cabin with beautiful views. Very nice cabin. Views are beautiful. Heartland Rental staff very kind and showed a sincere interest in making my visit a good one. The cabin was so much more space than we expected! We had an incredible experience from the guest service to the cleanliness of the cabin to the amenities and the view were all above and beyond what we thought we were getting! We loved everything about our cabin! It was the most amazing stay! Warm welcome, perfectly located cabin, convenient and made our trip easy to enjoy! We love the cabin and will be sharing Heartland Rentals info with our friends traveling to the area. Staff was great upon arrival, very thorough on directions and the ease of checking in was a great start to the trip. The cabin was extremely clean and exactly what we are looking for. The cabin was clean and well maintained. No complaints! Our stay was great! Sweet Dreams was beautifully decorated, met all our needs and allowed us the family r & r we needed! Excellent! Staff was great, we arrived early and the staff called to let us know the cabin was ready! Also, we had an experience that needed emergency personnel and staff reached out for us and followed back up! We’ve rented from another company in the past and always Leary about changing, but Heartland has gotten our business now! We have been coming to Gatlinburg for many years and renting cabins most of the time. However , this is the first time using Heartland Cabins Rentals. We were very pleased with the customer service and the cabins were by far our favorite. We plan to return soon and will stay at Heartland Cabins for sure. Great cabin and very helpful staff at heartland!! We loved it !! Sweet Dreams is an excellent cabin. Well equipped, roomy but still felt very cozy. Location is great. Access is very good. The view off the deck looks directly at the Smoky Mts. The only upgrade I could think of would be better shower heads to take advantage of the very good water pressure. Cabin was clean and peaceful. It wasn't to far up the moutain , but it was very private. We received excellent service from Ashley and the staff at Heartland. The cabin was wonderful and everything we hoped it would be. This was our second time to use Heartland and we'll continue to use them in the future. Would highly recommend Heartland Cabins and the Sweet Dreams Cabin. Always stay with heartland because even if a small problem comes up they are quick to solve it. Great cabin and views that allowed us to spend time together as a family. We stayed in this cabin 9 years ago and it was a great way to create new memories in a familiar home. We saw a black bear on the 1st night of our stay. We enjoyed the pool table and the hot tub. Convenient to Gatlinburg. Very nice place and well kept. Our cabin was very peaceful and relaxing. We enjoyed the cabin and the location. We spent time checking out the attractions in town and then came back to the cabin and relaxed in the hot tub! We’ll be back next year! My husband and I invited his parents for the weekend to view the synchronized fireflies and it was the perfect location for our needs! We will definitely be back! 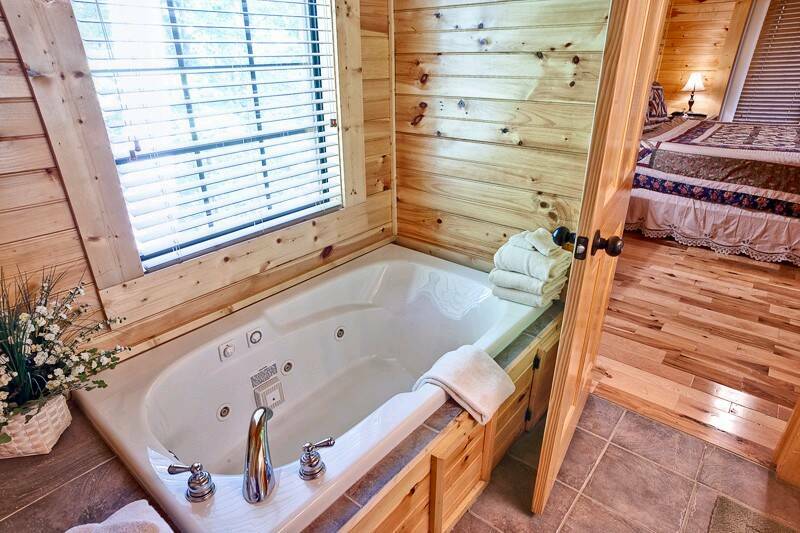 The cabin is just beautiful and perfect for two couples to have fun together but still have plenty of privacy. We thoroughly enjoyed staying at Sweet Dreams for our first trip to the Smoky Mountains! So very spacious and relaxing! The rental was very nice and accommodating with an excellent view. We thoroughly enjoyed our stay at Sweet Dreams. The staff at Heartland was very helpful and gave some excellent recommendations for restaurants in the area. What a beautiful location for our wedding and honeymoon. We will definitely be returning to Sweet Dreams for our anniversaries. We are also planning a long weekend with friends and this will be the perfect location. Cabin is beautiful and well maintained! Perfect place for all occasions! We stayed in this cabin several years ago, and it is just as nice now as it was then. It is very easy to get to. I especially enjoyed taking pictures of the snow covered mountains to the south on April 17, 2018. The person who checked us in [and out] was nice as can be. 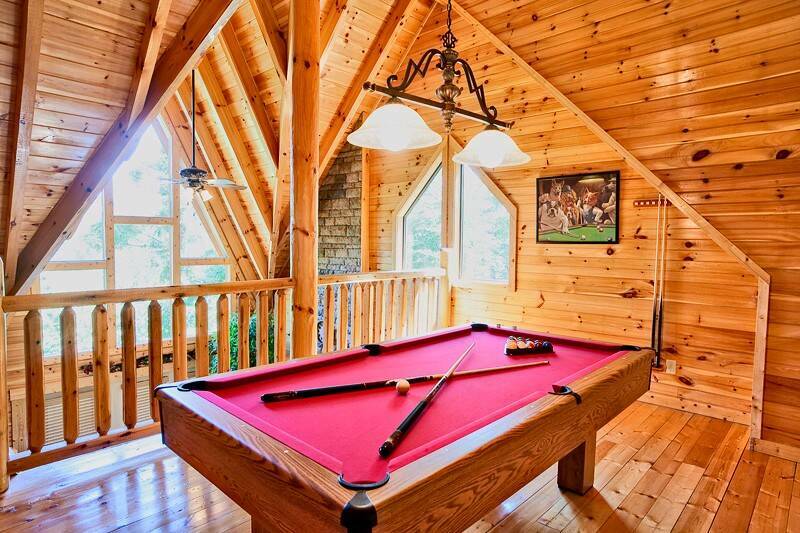 No doubt we will try to reserve this cabin the next trip to Gatlinburg. The owner[s] can be very proud of this property. We were very happy with the cabin Sweet Dreams. The cabin had everything that we needed, linens and cookware, etc. My granddaughter especially liked the pool table. We did not get a chance to use the hot tub as it was a little to cool and rainy on our weekend stay. Loved the privacy! The cabin and view was wonderful. The only complaint I have is the couch was very uncomfortable. The view was spectacular. Overall the cabin was fantastic. We really enjoyed our stay at Sweet Dreams. The cabin was very nice and clean and had a gorgeous view. Look forward to staying at this cabin again in the future. First off check in was a breeze. Our cabin was very clean and also decorated for the holidays. The view was amazing and there were to cabins close by but far enough to have your own privacy. The drive into town wasn’t to far. My wife an I will staying with Heartland cabin rentals again. Thank you for the great service! Awesome! Beautiful facility and location! Couldn't have been better. Management company was wonderful too! Beautiful place to disconnect from the world for a little while. Cabin was perfect. The layout was simple and accommodating. The views were spectacular. The stay was relaxing and we could not think of anything else we needed. Though we are simple creatures. It was EVERY THING we wanted and more! We have stayed in several cabins in the Gatlinburg area but Sweet Dreams was by far the nicest! The cabin was very clean and the view was just awesome! We had a hard time leaving the cabin to go out we liked it so much. It's peaceful and private. It's right in between Gatlinburg and Pigeon Forge. Only a 10 minute ride to either place. We will definitely go back to Sweet Dreams! Also the representatives at Heartland Rentals couldn't have been any nicer. Super easy to book. Thank you all for helping us with our short getaway! Home was amazing, beautiful view, very clean, enjoyed the hot tub, and very private. Remote location and we met a very nice neighbor while outside grilling! Wonderful location to shop the Craft Loop of Gatlinburg. Would definitely return. We will definitely be coming back. It was the most beautiful place we have ever stayed. We really enjoyed our 3 day wonderful stay at this cabin. Beautiful location with scenic beauty all around. 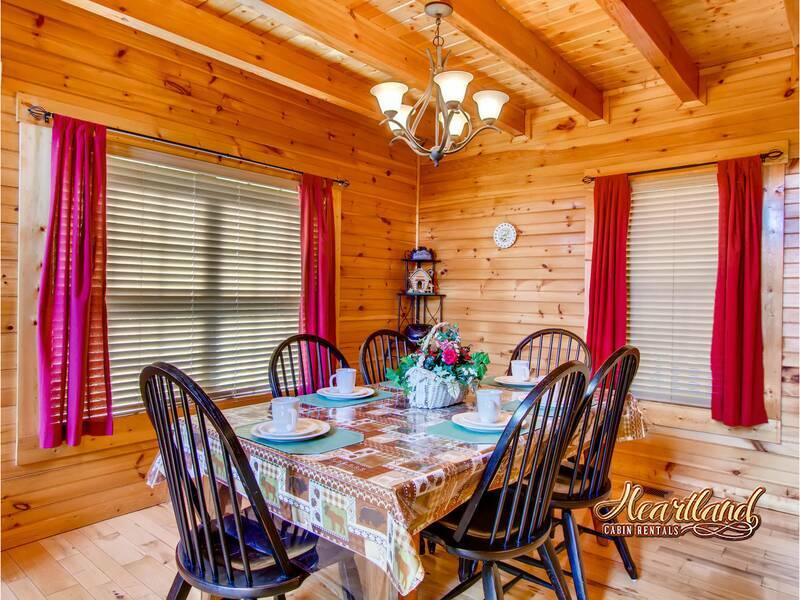 It's neat and clean, well furnished and well maintained cabin. All the daily requirements like towels, dishes and cooling items were available. Management deserves full compliment for our comfortable stay. Our little ones enjoyed the stay in the cabin and didn't want to leave the last day. We hope to come back to same place in future. Our stay was very relaxing and peaceful. Overall we thought the cabin was wonderful. Perfect amount of privacy. Also had a great view. The beds were comfortable. It had everything we needed. If I could give one example of something it could improve on. It would be more comfortable furniture in the living area. Other then that it was perfect! I would book it again. Thank you! We stayed for 5 nights and it was perfect . We will definitely be staying again. The Heartland staff were great. Thanks again. I brought my wife here to celebrate her birthday. We had an amazing time and enjoyed everything at the cabin. The view is the best part. We also got to see our first bear just 3 feet from the grill in the yard! She loved her birthday weekend thanks to Heartland and the spectacular cabin! The cabin was my favorite! Beautiful mountain view and so peaceful. Always book our cabin through Heartland. They are always so helpful and accommodating. We stayed for 4 nights over Thanksgiving weekend. Everything was perfect (even things you can't control like weather). After dozens of trips to the area, Sweet Dreams is my wife's new favorite cabin. Everyone enjoyed the smooth, paved roads up to the cabin (only last 50 yards are gravel). It's quiet. It's private. You have a wonderful view of Mt. LeConte from this mountaintop location. The staff at Heartland were friendly and helpful. We will be back. Aside from a brief venture into the city, we spent almost our entire weekend at "Sweet Dreams." Four of us went, 2 couples, and it was the perfect amount of space. Our primary concern was getting a cabin high in the mountains with a good view, as some of the pictures are inconclusive, and we lucked out with this one. High up, amazing view, fireplace and plenty of space, right next to all the ceramics shops... We'll definitely be returning. Great cabin! Beautiful views from the back porch! 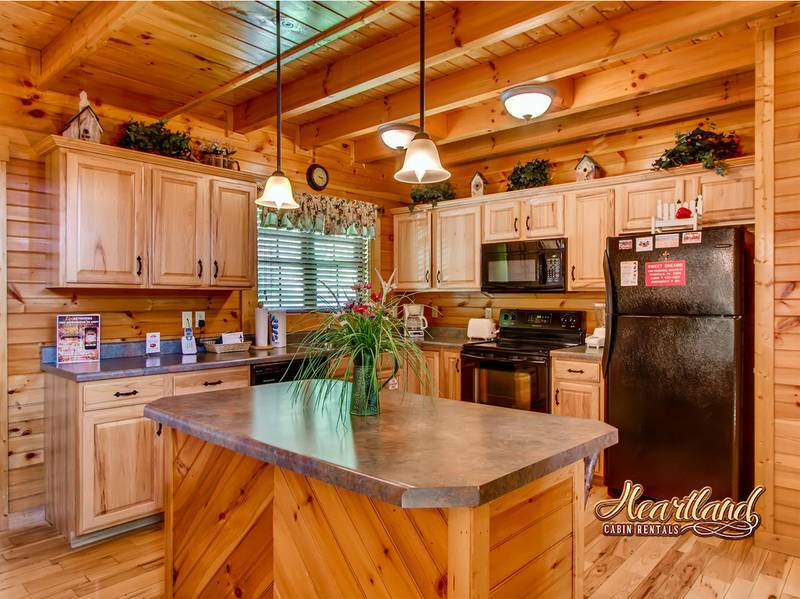 This cabin has a great open floor plan with large kitchen with island, dining area, living area, and great size bedrooms and bathrooms. Only negative was the pillows were not too comfortable. One suggestion also is maybe a different chair in living area and move rocker where tree is in the corner. Over all we enjoyed our stay and would stay here again. Heartland staff was great and helpful! We had to call about heating and cooling issue and problem was resolve quickly! Just returned from a three-day trip to Gatlinburg for my niece's wedding. Our cabin was beautiful and the view was spectacular! 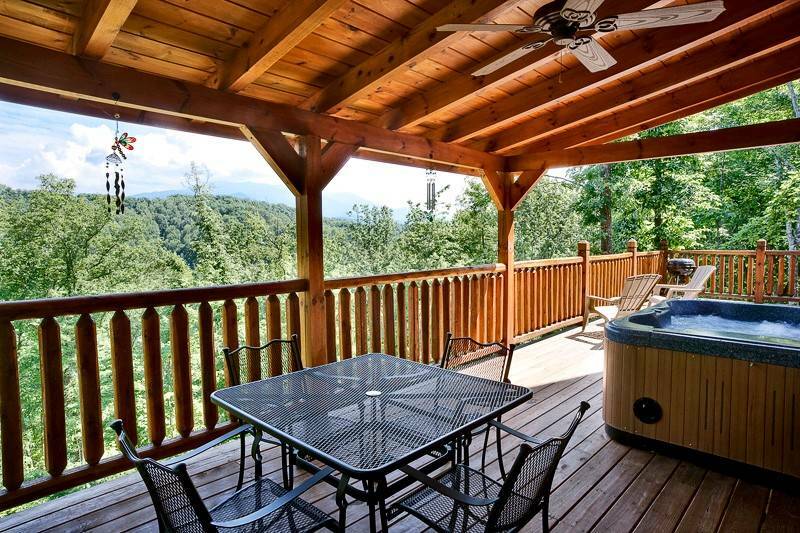 The hot tub is in the perfect spot and the windows in the cabin are placed for the most amazing views of the mountains. It is so close to town, but far enough out where you feel as though you are in the Smokey Mountains. I would recommend to all my friends and definitely stay there again! Loved it! Definitely will be back. Clean, well furnish and comfortable. we had a very great stay . the place was very beautiful and clean. thanks for all the help that was giving to us while we were at sweat dreams. we really enjoyed our stay and the view from our deck. we also like the privacy. Our stay at Sweet Dreams was absolutely wonderful! The house was magnificent. It was so comfortable and relaxing. A great get-a-way! Beautiful cabin, and my parents were glad I talked them into staying at a cabin instead of a hotel. Will definitely stay again! There is not one thing that could have been done to make out stay any better. From the staff to the cabin everything was beyond perfect . You made our honeymoon amazing! 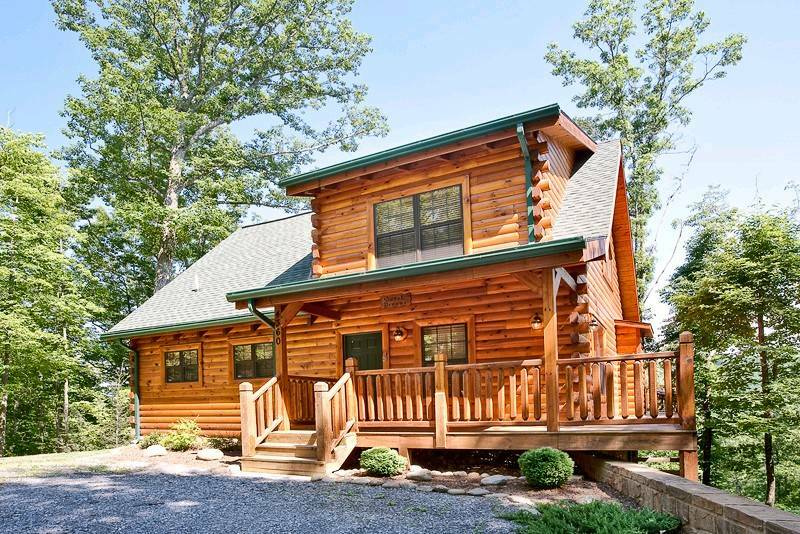 This cabin was absolutely perfect for our vaction, wedding and honeymoon all in one! I had my family visiting from Pennsylvania and they were so excited to get to enjoy the view and to explore the great Smokey mountains. One of the best touches I loved (besides the view and obvious things)was the wipes dark cloths for make up, the big fuzzy blankets, and the fact we over packed! The supplies in the kitchen were endless and that was so wonderful! Thank you so much for being so friendly and having such a nice and clean cabin! We decided to come to Gatlingburg and celebrate my husband and sisters Birthday. I located this cabin online and fell in love. Once we arrived the cabin was very clean and beautiful. It was so much better in person. I spoke to Holly and Ashley and they were both so nice and professional. We will be visiting again this fall and hope to stay in another Heartland Cabin. I always rent from Heartland Cabin Rentals. Friendly service and beautiful clean cabins. We found the cabin extremely clean and just absolutely beautiful. Highly recommend staying in Sweet Dreams. Heartland Rentals and particularly Holly were excellent to work with this year. We've been here several times and it's our favorite place to stay. The water pressure is sometimes little weak in the upstairs shower, thus the four out of five stars, but other than that, it's a well kept cabin with a great location. Your customer service team is great! Well ran organization. Very relaxing and pleasant with spectacular views from the lovely deck! The cabin was spotless and very comfortable. The kitchen was well appointed and we enjoyed using the grill. The deck was fabulous for early morning coffee and evening meals. The bathrooms were great with plenty of supplies. It was perfect! We would definitely come again!! The cabin is better in real life than in the pictures. VERY clean, very neat and has all amenities you need. It is kind of isolated higher up, but the area is very safe and the views were spectacular. Exactly 10 minutes away from Food City which has everything you might need. All in all it was a very good experience and it was a really clean cabin. Sweet Dreams is a beautiful cabin, friendly and prompt service when issues arose with the cabin. I will definitely stay with Heartland again. This cabin is well located to the Gatlinburg strip, the park, and we especially like that it was only 10 minutes from the grocery store. The layout was private with a bedroom upstairs and one downstairs. It was a great view and the place was well appointed. Thanks for a great visit. We will be back!! Everything was perfect. The cabin was amazing, the views were amazing, the privacy was great, there was not one problem with anything! WE WILL DEFINITELY BE BACK AND WE MOST LIKELY STAY IN SWEET DREAMS AGAIN! !!!!!! Heartland rentals was very friendly and helpful with the booking and throughout our stay. The cabin was beautiful, clean, and very well kept. Amazing view of the mountains, close to everything but still quiet and secluded. The perfect getaway for our small family of 3. We will definitely be using Heartland again. We had the best time! 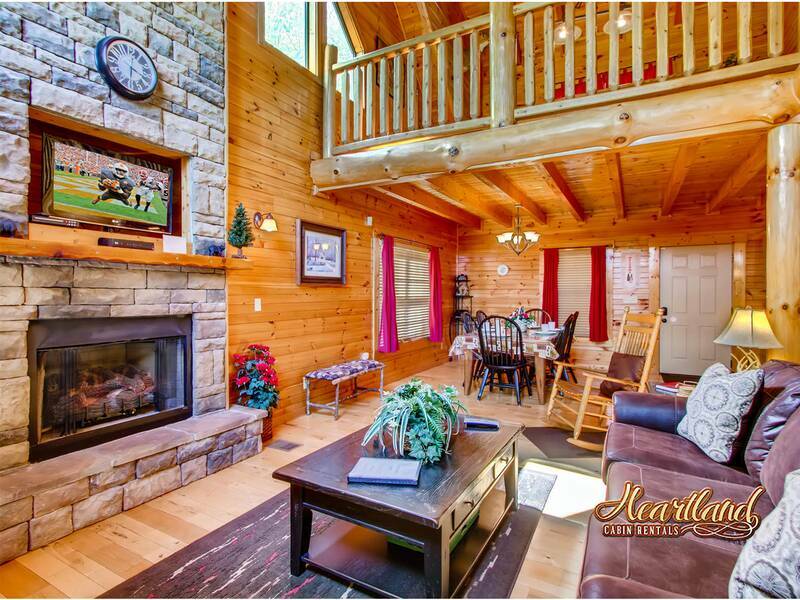 Perfect cabin for skiing and visiting Gatlinburg. Excellent cabin and beautiful accommodations. We had four children and ourselves and it was comfortable. Just as advertised and we had a wonderful trip. We will definitely be coming back to heartland rentals! Wonderful cabin to enjoy our vacation in! We loved Sweet Dreams! The cabin was comfortable and fit our needs perfectly. We especially enjoyed the mountain view and the gas fireplace. We will definitely recommend this rental to our friends and family. The location, view and cleanliness of the cabin was outstanding!! The cabin was clean, the view was excellent and very nicely decorated. The staff at Heartland was friendly and professional. We would definitely rent from this company again. The cabin was wonderful and the staff were friendly and helpful. I would recommend them, and if we get to go back in the future, we'll likely use Heartland again.